The ABCD Diaries: Celebrate Shark Week with Fun Products from Discovery! Celebrate Shark Week with Fun Products from Discovery! Discovery's 28th annual Shark Week, is in full swing! This monumental week officially started last night and will continue through the 11th. To get you in the spirit and allow you to celebrate Shark Week long after this week's shows conclude, Discovery offers a full lineup of Shark Week products that are sure to make a splash with fans! "Every year Shark Week takes fascinated viewers on a journey to the depths of the sea uncovering the secrets of the ocean’s top predator. Discovery’s longest-running programming event thrills fans of all ages who are fascinated by the often misunderstood shark. 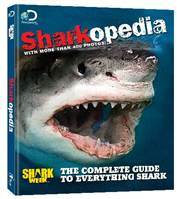 More than just a week-long ratings bonanza, Shark Week has become a pop culture phenomenon with a massive buzz factor." Find everything you need to enjoy Shark Week year round at participating retailers nationwide!